RINTAMÄKI, Katri and FLEMMING, Christina and LEHTO, Anne and TOUKONEN, Jonna (2017) Elements of Success in a Joint Academic Library for Five Universities. Paper presented at: IFLA WLIC 2017 – Wrocław, Poland – Libraries. Solidarity. Society. in Session 112 - Poster Sessions. In the 2000–2010s Finnish universities and universities of applied sciences have become public corporations. The ideal is an effective, productive, business-like university with lean infrastructure and support services. One solution for pursuing cost-effectiveness is joint support services. 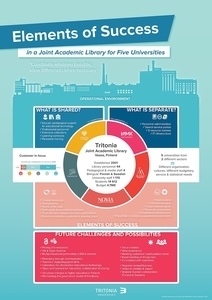 In Vaasa the five university units - University of Vaasa, VAMK University of Applied Sciences, Åbo Akademi University, Hanken School of Economics, and Novia University of Applied Sciences - form joint Tritonia Academic Library. Tritonia is empowered by the joint resources: specialized personnel, extensive collections, pedagogical support for educational technology, learning commons, and modern library space. These components create a unique brand of Tritonia. However, networks, portals, and e-resource license agreements specific to each parent university create challenges. Five parent organizations from two separate university sectors have different service, budgetary, and statisti cal need s. Tritonia as a joint support service must offer equal services, create sense of fair play, build trust with and between the host organizations, and stay up-to-date in organizational changes, react proactively for the changing service environment, and offer more personalized services closer to the core services of each university. This poster describes good practices and future possibilities for a joint academic library.